Arugula is definitely not your average leafy salad base. With its slightly spicy and peppery taste, it goes well with many meals including a grilled sandwich, on pizza, pasta, a spicy pesto or even an omelet. It even packs a punch in the vitamin department, delivering on vitamins A and C.
Arugula is in season during spring and summer, but we are fortunate to have access to it year-round. 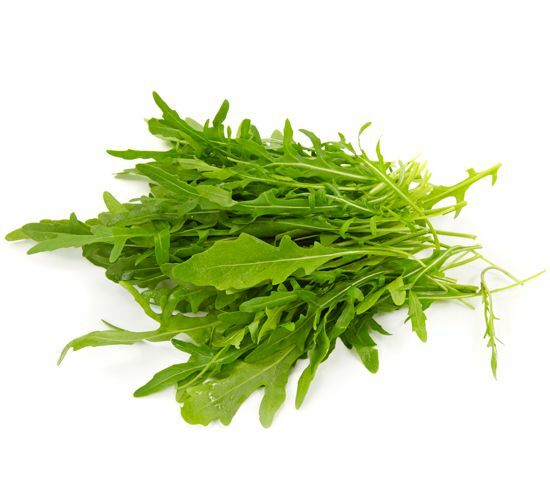 While shopping for arugula, you may find it under a few names including rocket, roquette, and Italian cress. Make sure you purchase your arugula no more than a few days before using as it spoils rather quickly. Mature arugula looks very similar to the leaf of a radish, and usually comes in bunches like spinach. Choose bunches that are bright green and fresh looking (avoid those that look wet and bruised). Wash bunches in cold water, then dry and store wrapped in paper towel in a plastic bag in the fridge – this will help to keep if fresh longer. Baby arugula comes pre-washed and packaged, and is less peppery than mature arugula. If buying arugula in bunches, cut the bottom off and discard. Then separate the leaves and give your arugula a good wash in the sink as they hold a lot of grit. By swishing it around in the sink, it will let the grit sink to the bottom of the sink. To dry, you can use a salad spinner or pat dry with a towel. 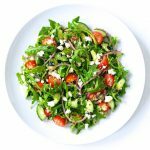 Arugula makes a great salad – try it with goat cheese and an olive oil based dressing. Also, try braising or sautéing as a side to seafood such as tuna or salmon. Purchase arugula shortly before you are going to use it. If arugula has spoiled, it will smell sour. Be adventurous…it’s not just for salads! I bet you’ll love the flavour it adds when topped on a pizza after it comes out of the oven or even a sandwich or pesto. 1 loose handful is about a cup – great for measuring how much you’ll need for a salad.